Happy Saturday Friends! Today is officially my first day of Spring Break! I wanted to share something I did with my students to motivate them to READ! 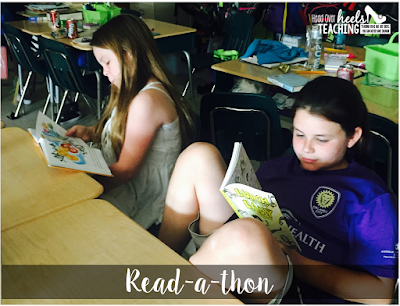 I kept my students after school for 4 hours to READ. Yes, it's that simple...to READ. EVERY single one of my students attended. :) (I actually had to change the day so three could attend-they were so upset about missing "reading", that I had to change it for them.) I can't tell you what this does for my teacher heart! Even some of my parents commented how excited their child was to attend. I could tell they were a bit surprised that their child wanted to stay after 4 extra hours just to read! LOL! I wanted to keep the anticipation and excitement up all day so I displayed this sign on my light up frame and created a bulletin board to track their reading progress during the Read-a-thon. What would a Read-a-thon be without food? 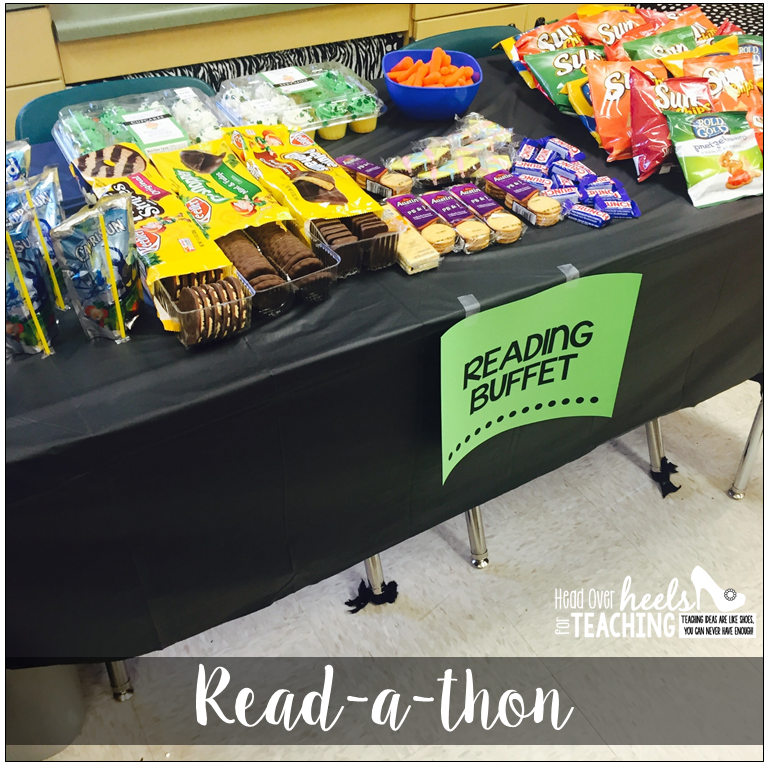 We had snacks and drinks at our reading buffet because with all that reading we would definitely work up our appetites! And, bookworms! My students loved the worms! 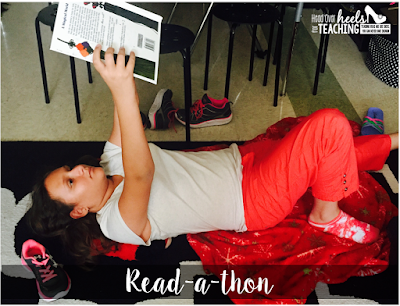 They took off their shoes and brought pillows and blankets to get cozy with their books. (I think taking off their shoes was their favorite part!) 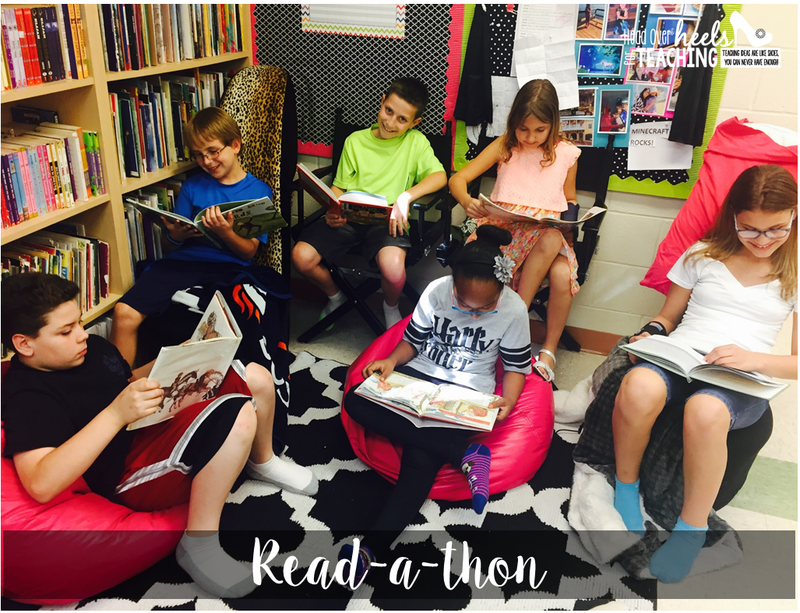 They read everywhere in our classroom! After about two hours, I had pizza delivered. 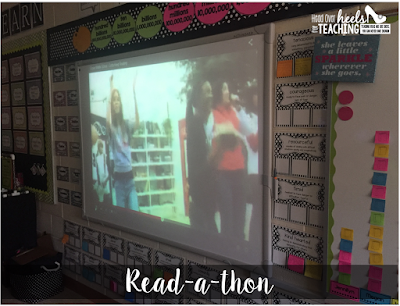 We watched the Gotta Keep Reading video to inspire us to keep reading for two more hours. I love how the entire school collaborated to create this video-it's amazing! A must see! Well, if music is playing, we HAVE to dance! 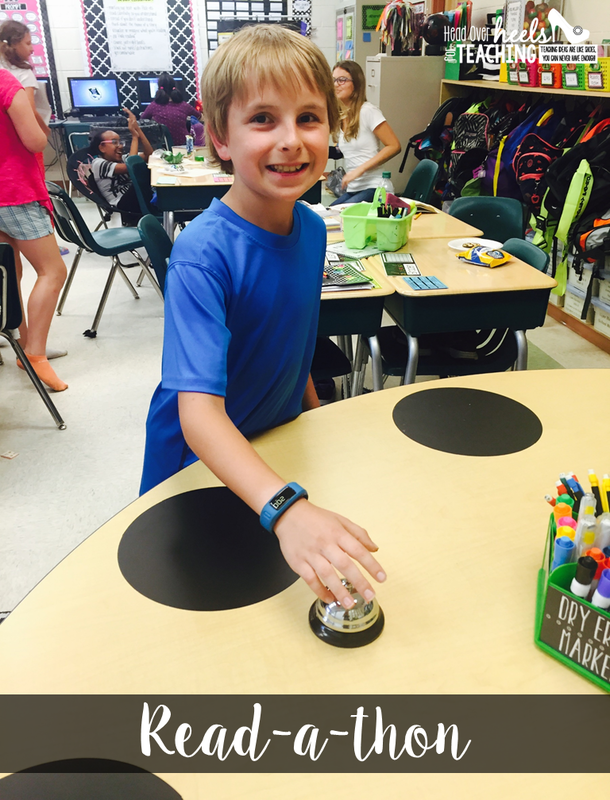 After every Reading Counts test they passed, they got to ring the bell! That bell was ringing all afternoon, but it's ok, it was music to my ears! 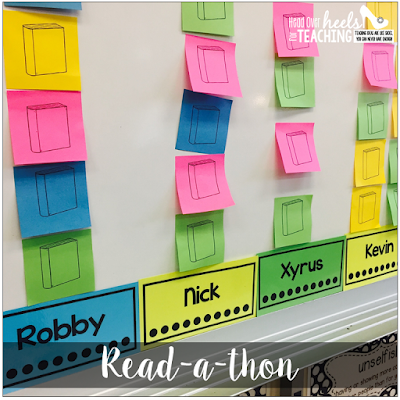 After they rang the bell, they got a book Post-It for each point they earned to display on the board. This was a great visual for us to be proud of as a class and each individual student. 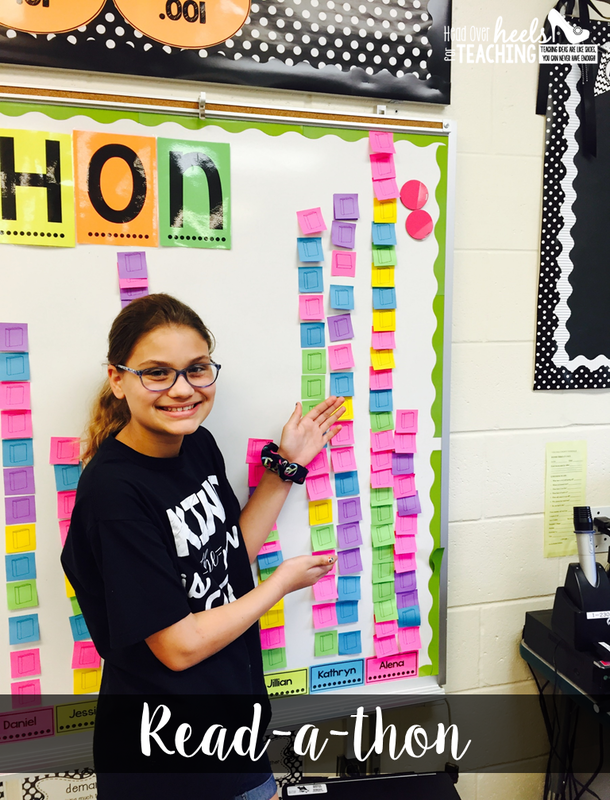 Some students had to make a second row of sticky notes!! There wasn't a contest, but this young lady earned 38 Reading Counts points during the Read-a-thon! Pretty impressive! The goal was for each student to earn 20 Reading Counts points. 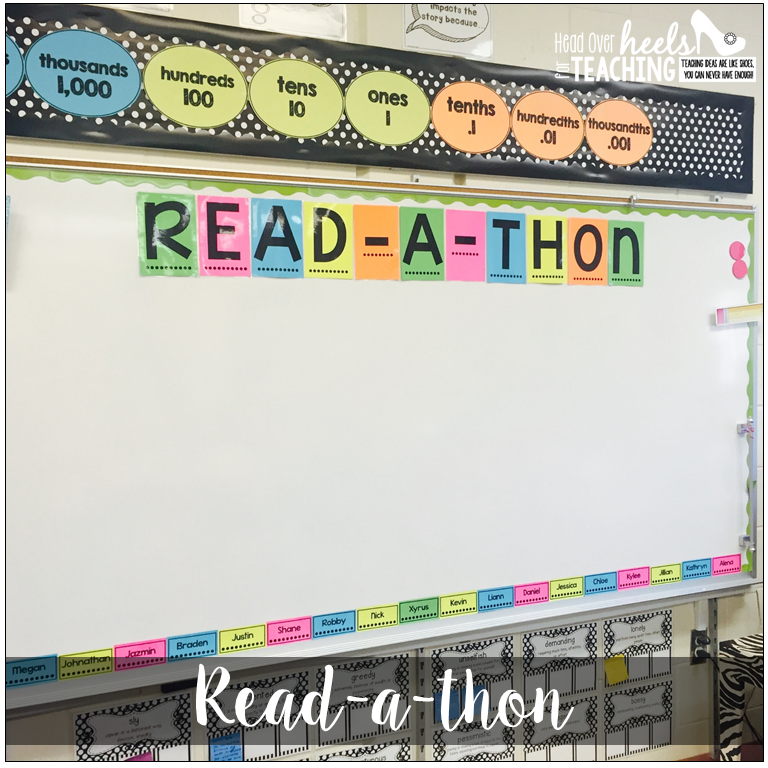 I was excited and inspired by my students' excitement to read, ring the bell, and post their book notes on the board! They celebrated each others' successes too! 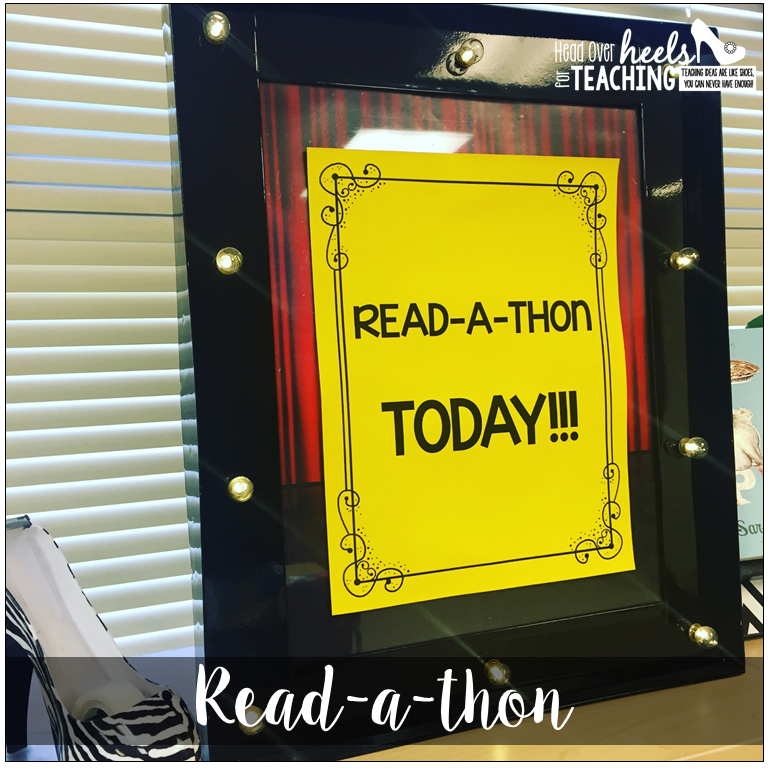 I've done this a few times with other classes and will for sure keep this as an annual event in our classroom! I love this so much!! Looks like your kiddos had a great time!! 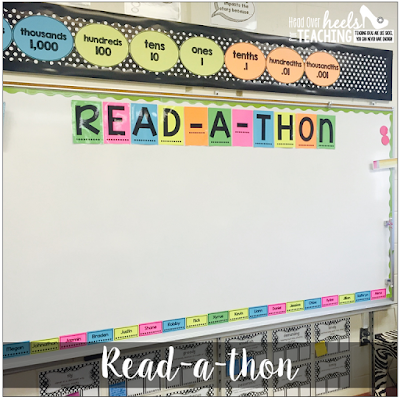 We do this also in our classroom but we call it a Read-In and we do it during the school day in the afternoon or morning depending on what is going on. I love your snack idea and the ringing of the bell. I will need to add this to my Read-In's. Love this idea! Can you explain what your Reading Counts is? What were you tracking to earn the points and ring the bell? I think this is a wonderful idea! It's clear that you and your class are a tight community which is a beautiful thing! Love this idea! One question- Are the kids reading books on their level or just any books? Totally off-topic, but I am wondering where you got your place value posters above your whiteboard? I love this idea! The snacks are too cute! I even love the bell. We do Accelerated Reader in our school. We could use the bell when they pass their quiz. Thanks for the ideas! This is awesome! 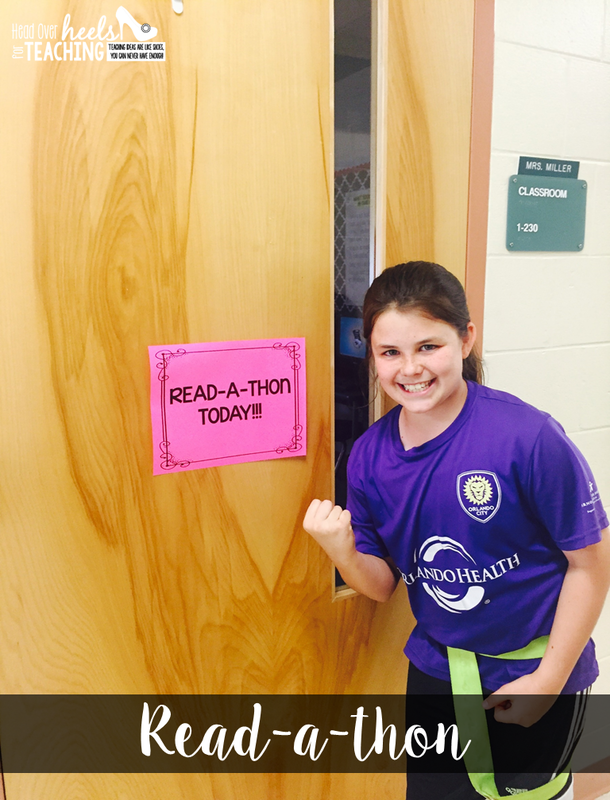 This year I started a school-wide Read-a-Thon and our 5th-8th graders filled the hall for four hours after school! It was terrific. :) Other teachers were so surprised that over 100 kids would want to sit and read on a Friday night. :) If I had a self contained class, I would probably do two-three of these a year! Hello! My team and I are doing this activity this coming week! We are so excited! 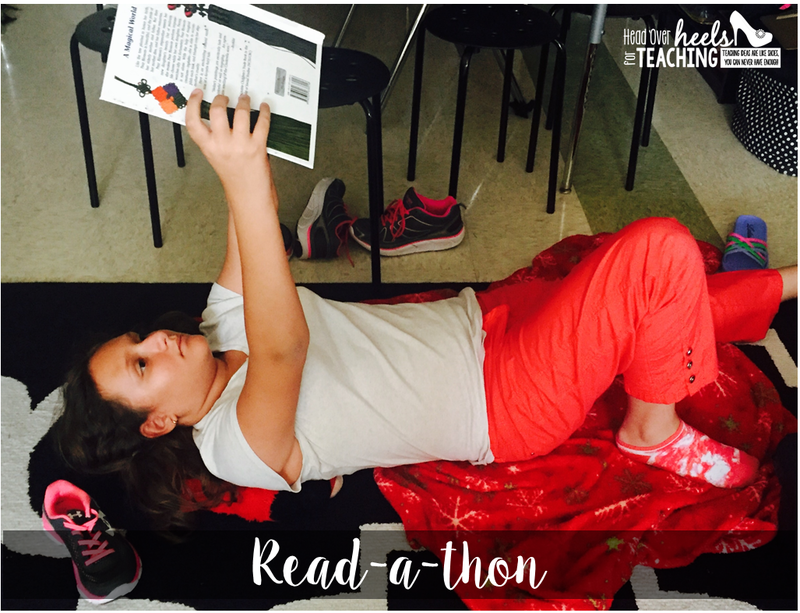 Where did you get your banner that says READ-A-THON? 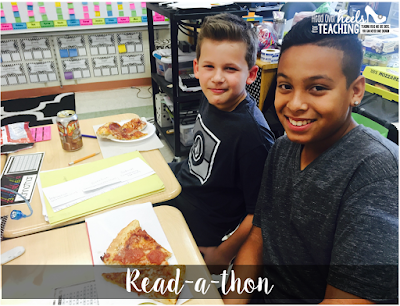 We are doing Read Quest this week. I will certainly be adding some of your ideas to my day. Thanks for sharing!!! This is so incredible! I have been searching for different methods of pumping my students up with Reading Counts tests and just finding joy in reading! 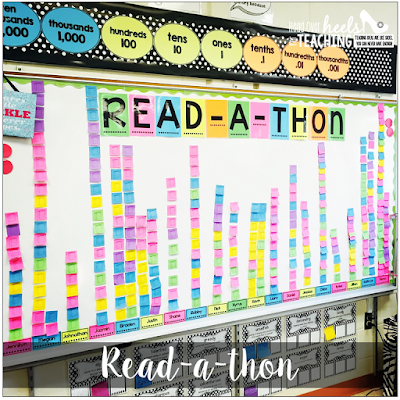 I have a Reading Counts wall dedicated to tracking their progress (similar to your whiteboard graph)! It's an awesome way for myself to keep up with their progress throughout the week and for the students to get motivated and catch up with their peers. 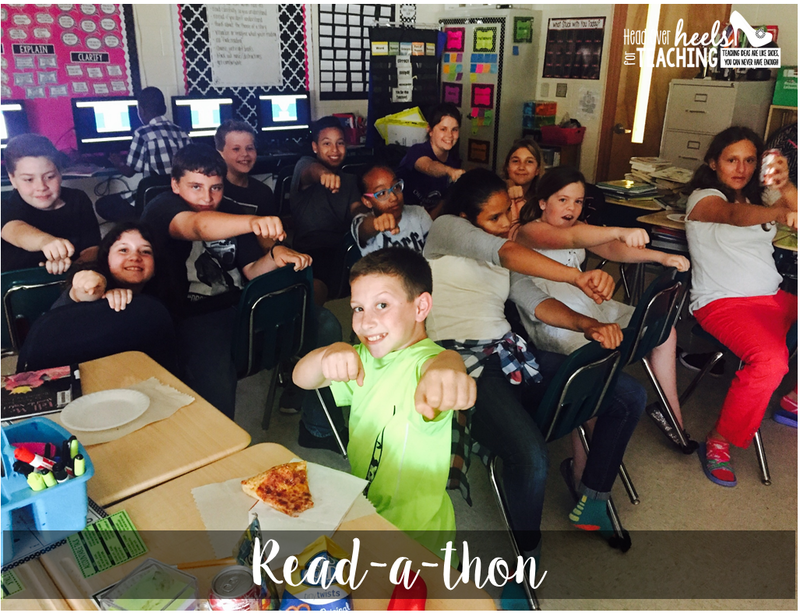 Also, my school has implemented reading counts celebrations as a way to motivate and encourage the students to read. 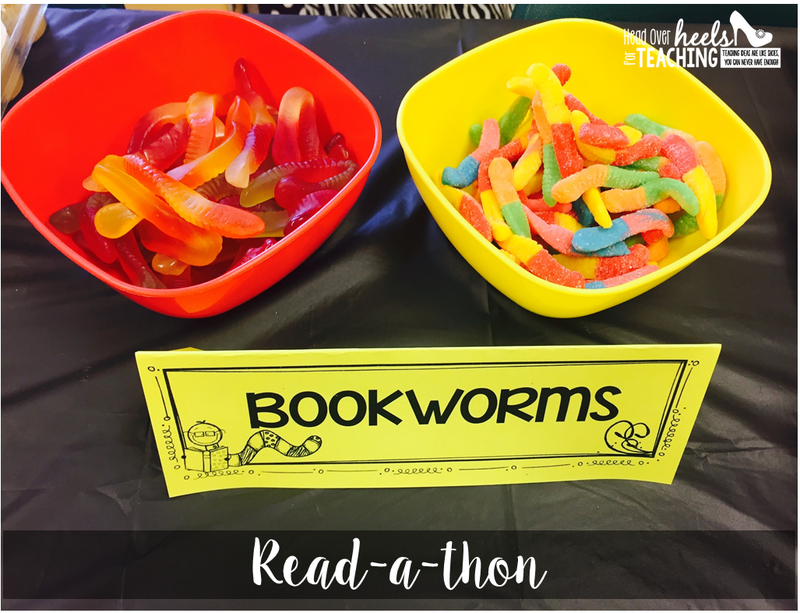 At the beginning of each quarter, our schools' literacy team hosts a pep rally to reveal the end of quarter reading celebration! Following the pep rally, each student sets a goal and focus on their progress daily through the use of their RC folders and data sheets. I house everything from the reading logs to their lexile data in this one folder. Surprisingly, students keep the folder updated without my warning. 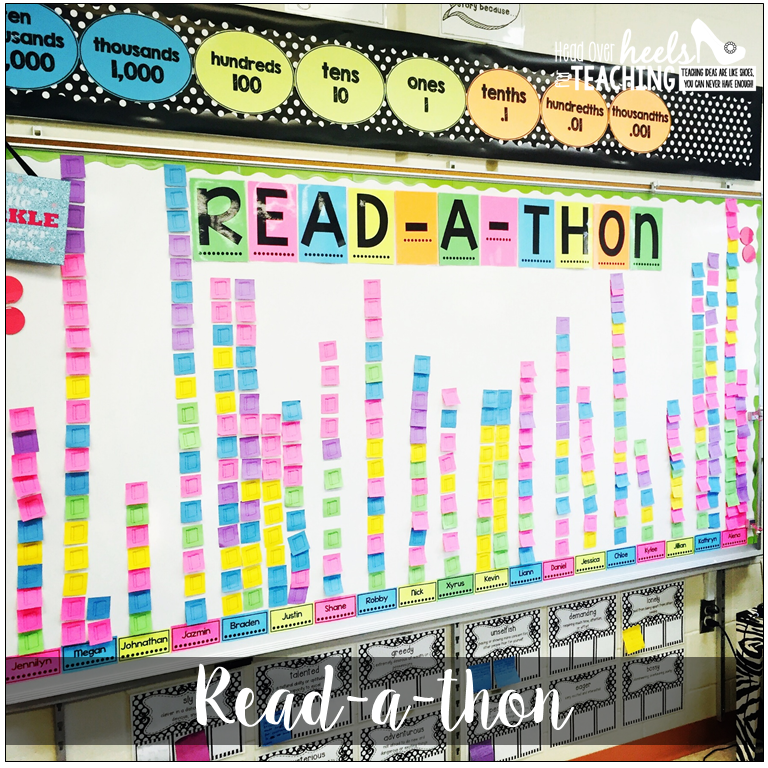 At the end of each quarter, my students' and I conference about their reading goal to decide on whether they have achieved their goal for the quarter. I have rarely had a student not meet their goal! Thank you so much for sharing this wonderful idea! I cannot wait to share this with my grade level team! Call Of Duty Ghosts Free Download From here.